w ith ics streamlined body, the African Finfoot is able to swim well, either fully on the surface or with its body submerged and the neck and head out of the water. The feet, with their wide, fleshy lobes, make very effective "paddles." The bill is slender and streamlined. This secretive bird lives where trees and bushes overhang a river or lake. It spends as much of its time on land as on the water, feeding on insects and small aquatic life. • NliST A large, flat nest of grass and stems, placed in dense vegetation at the waterside or on a partly submerged branch. 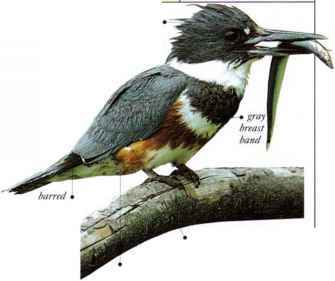 • REMARK The female is more brightly colored than the male and is thought to play the dominant role in breeding, while males look after the nest and young.